You look up from your steering wheel or cautiously pull back the curtain to see… wait for it… a pair of thin, trendily dressed, usually olive skinned teenagers. These aren’t your average, ordinary scallywags. These adolescents have something horribly wrong with them — something almost none of the witnesses notice at first glance — it’s their eyes. These “creatures” have no white corneas, no colorful irises, just a pair of big, black, shark-like eyes that inspire abject horror in all who have claimed to have seen them. What’s worse is that these bizarre younglings aren’t content to scare you and continue on their merry way; no they are insistent that you help them. 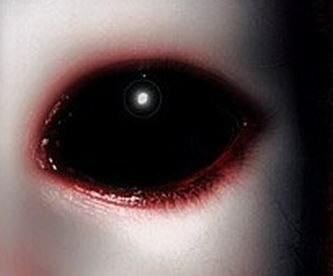 They stare through you with those dull ebony orbs and demand you let them in your car and give them a ride home or that they be allowed into your house to use your phone. The most horrifying aspect of all of this is that those who claim to have encountered these sinister kids swear that they’ve had to actively resist the temptation to do their bidding, as if their voices carried some sort of hypnotic influence. Here are the common characteristics. • Lifeless eyes, black eyes. Like a doll’s eyes. The creepiest thing about all these stories is that we have no examples of what happens if you agree to these creepy teens wishes. This leads us to two possible conclusions. A) They have the worst form of mind control in the world. B) What happens to those who fall for their tricks is so horrific, no word escapes past the void. Also interesting is the speculation on what the Black Eyed Kids could be. Vampires? Lost Souls? Demons? Kids Who Really Need To Use Your Bathroom? when I was reading the list of features, the first 5 sounded a lot like my ex-girlfriend. …and the moral of this story is that you should never help anyone ever. Maybe it’s the offspring of The Silence from Doctor Who?